Górecki began composing music for unaccompanied choir in the 1970s, with the sacred texts of Euntes ibant et flebant (1972), Amen (1975) and Miserere (1981). He also began a series of folksong arrangements with Broad Waters (1979) and during the 1980s expanded both his secular and sacred repertoires with further arrangements and new pieces, and it is from these works that this afternoon’s programme has been drawn. Interlaced with the choral pieces are two early works for solo piano, a medium that he did not return to after his student days apart from some pieces for his children and grandchildren and occasional birthday presents for friends. With the elevation to the papacy of Cardinal Karol Wojtyła of Kraków in 1978, many Polish composers flexed their muscles anew with sacred works that sat uneasily with the communist authorities. For example, the government tried all it could to thwart the premiere of Górecki’s Beatus vir which had been commissioned by Wojtyła before he became John Paul II and which Górecki conducted in Kraków during the Pope’s first visit home. By the time of the Pope’s third pilgrimage eight years later, things were changing fast in Poland. The Solidarity strikes of 1980-81 had led to the imposition of martial law and mass imprisonment of ‘dissidents’, but by 1987 the situation had improved considerably and within two years democratic elections were held and communism in Poland had been consigned to history. Totus Tuus was premiered at a mass in Victory Square in Warsaw in July 1987 in the presence of John Paul II. Fittingly, the text by Maria Bogusławska was based on the Pope’s apostolic motto, ‘Totus Tuus’ (Totally Yours). This itself was drawn from the writings of the French priest, Louis de Montfort, whose Treatise on True Devotion to the Blessed Virgin (1712) was a particular inspiration to John Paul II. Górecki’s setting is direct and joyful. Its homophonic language is uncomplicated, the harmonies diatonic and resonant and its repeated phrasing commensurate with its roots in Roman Catholic chant and church songs. In the middle section, by means of subtle enharmonic shifts, Górecki brings a new radiance to the reiterations of ‘Maria’. Górecki was something of a late starter compositionally. Coming from a poor background, far from any large musical centres, he worked initially as a primary school teacher (1951-53), then found a place on a teacher training course (1952-55), while at the same time playing catch-up on his music studies and travelling long hours by train to and from the city of Katowice, with its symphonic concerts and opportunities to buy the occasional score. He was essentially self-taught until he entered the Higher School of Music at Katowice in 1955. Four Preludes was Górecki’s official op.1, although he held back the premiere until 1970. The four movements are grouped as a sort of sonata, with the most substantial first, followed by a slow prelude, a scherzo and a finale. His knowledge of Western contemporary music at this point was slight – like that of most other Polish composers emerging from the blinkered conditions of socialist-realist cultural dogma – so it is hardly surprising that the preludes are stylistically inconsistent. But burning through them is the fire of youthful exuberance. The sonata principle underlies the neoclassical roots of the opening toccata, while the folk-related lament of the Lento has an expressive weight that reaches beyond its 32 bars. There is gentle mischief in the scherzo, also with a folk-related motif, and this leads directly into the whirling finale, whose ancestry may lie in the last movement of the Third Piano Sonata by Chopin, a composer whom Górecki referenced more closely in later works. 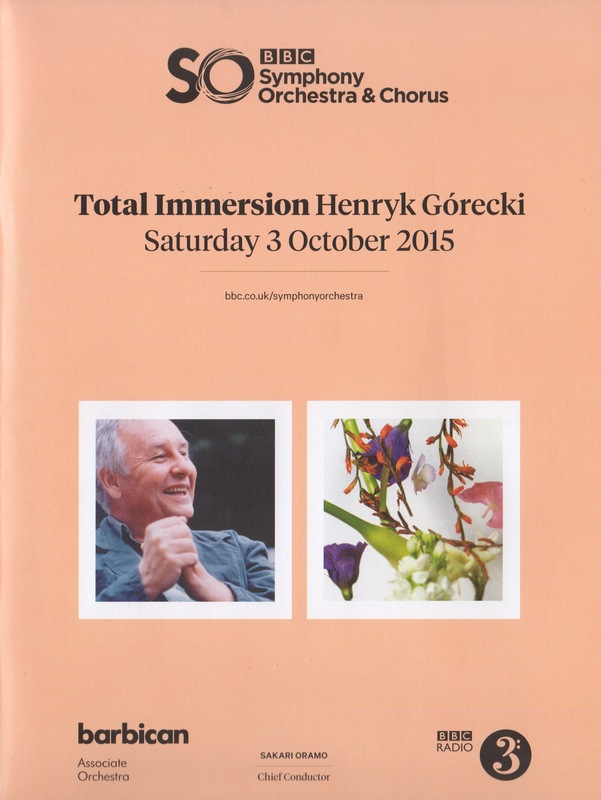 Górecki arranged these five songs at the end of a three-year recuperation from surgery. His next work, O Domina nostra for soprano and organ (1982/1985) was specifically dedicated to the singer Stefania Woytowicz, who with her husband, the surgeon Stanisław Rudnicki, had played a crucial role in bringing him back to health in the early 1980s. The Marian Songs were completed in the same month (February 1985) – although the premiere was not until 2005 – and the two works undoubtedly share the same thankfulness to the Virgin Mary. He dedicated the Marian Songs to Cardinal Franciszek Macharski (b. 1927), who succeeded Karol Wojtyła to the See of Kraków, knew Górecki well and officiated at his funeral mass in Katowice in 2010. The Marian Songs (1985) are fine examples of a particular feature of Górecki’s sacred choral interests in the mid-1980s. His main source, as in the Church Songs (1986), is Śpiewnik kościelny (‘Church Songbook’) compiled by Father Jan Siedlicki in the 1870s and still in use today. Górecki had already mined its rich contents for the canon of the first movement of the Third Symphony and he takes most of his melodies and texts in this work from Siedlicki. Several of the songs (1, 2 and 5) are from the Songbook‘s section dedicated to the Virgin Mary. No.3 is an Advent hymn with a different melody (not to be confused with ‘Zdrowaś bądź, Maryja’ (‘Hail Mary’) from the Church Songs that does use the Siedlicki melody) and No.4 is taken from another compilation. Górecki’s approach is one of reverence to the original material, with some verses cut and some rhythms subtly subtle changed. He harmonises the melodies tenderly, with the occasional expressive dissonance. The first song is the simplest of the five, its four verses rotating like a chain of rosary beads through a few major and minor thirds. The second, also complete (there are five verses) and faithful to Siedlicki, is less naive in character and expands to explore triadic sequences. The central song, ostensibly the most devotional, was the first to be released from Górecki’s workshop and was recorded in 1993. Górecki sets just the first and third of twelve verses. The origins of no.4 are still a mystery (neither melody nor text is in Siedlicki). It has perhaps the densest textures of the cycle. Siedlicki labels the melody of the final song morawska (Moravian); it is certainly the most active intervallically. In his setting of just the first of four verses, Górecki expands his voices at times to nine parts. As a coda, he repeats a couple of lines and ends with the deep reiteration of the phrase ‘na wieki’ (for ever). Like a number of his early (and late) works, the Piano Sonata waited some time before Górecki was ready to release it for performance in 1991. In the meantime, it had gone through two revisions, and the places and dates that he inscribed at the back of the manuscript score are a sort of timeline of his life. He composed the Piano Sonata at the end of his first year of study in Katowice, completing it in his parental home to the southwest (‘Rydułtowy, August 1956’). He revisited it almost thirty years later when on holiday in his rented mountain log house (‘Chochołów, May 1984’), and had further thoughts in his studio back in the city (‘Katowice, November 1990’). It is hard to say what effect these revisions had on his student score, but it is not impossible that some of the slow sections at least date from one or other of the revisions, so carefully and precisely pointed as they now are. The outer movements show the composer in ebullient form. No-one who witnessed Górecki playing the piano will ever forget it, and these two movements embody his ferocious and intense performance style. No fortissimo could ever be too loud (and, conversely, no pianissimo too soft), no rhythm too emphatic, no tempo or register too extreme. He always wanted more. The first movement, again outlining a sonata structure, opens with a clear indebtedness to Bartók, Stravinsky and even Prokofiev. There is a contrasting central section, the first half of which is reflective, the second of which curiously recapitulates the second subject even though it also recurs in the recapitulation proper. The central movement, all thinly scored 24 bars of it, is perhaps an echo of the second of the Four Preludes: ghostly, otherworldly, an interlude rather than a fully fledged movement. The finale also pauses for reflection partway through, but its essence is a heavy-booted mazurka that gives his heritage from Chopin and Szymanowski a new kick and swagger. Authentic and humble artists are perfectly well aware, no matter what kind of beauty characterises their handiwork, that their paintings, sculptures or creations are nothing else but the reflection of God’s Beauty. No matter how strong the charm of their music and words, they know that their works are only a distant echo of God’s Word. For non-believers this is irrelevant, but for Górecki these words encapsulated his belief about the nature of music and of his own creativity. For example, he saw Poland’s folk and sacred traditions as part of one whole and, when he selected the hymns that he wanted to include in Church Songs, he chose some that were evidently hymnic and others that had folk elements. Most of his arrangements of the church songs remained hidden in the bottom drawer during his lifetime. He released a couple in 1987 with characteristic reluctance (for him they were written for his private enjoyment and contemplation). A CD of almost all of them was issued by DUX in 2013 and the scores have been published by PWM in Kraków and by Boosey & Hawkes in London. They are eminently singable by amateur choirs, not least because they have both the original Polish texts and tailored Latin translations. ‘Audi clamantes, audi plorantes’ (no. 21) was incomplete when Górecki made an inventory of the Church Songs in 1991. Once again, as with the others in the collection, it draws its melody and text from Siedlicki. It comes from the section devoted to the Holy Trinity. Its 6/8 metre is relatively uncommon, although given its G minor tonality the tempo is implicitly slow rather than lively. Even so, the song has a lilting, dance-like quality. This is partly effected by the snap rhythm on each beat in the bass drone, reinforced by the rocking harmonic alternation on the main beats in the tenor line. The melody and full text of the five verses are assigned to the sopranos and altos. Like the rest of the collection, it has a disarming, unassuming quality that echoes not only the singing Górecki heard in the wooden church in Chochołów but also the words of the Polish Pope.